Bosch 12 Volt Coil Metallic Foil Sticker 2"
Bosch 12 Volt Coil Yellow Sticker 2"
Bosch Batterie Car or Motorcycle Battery Sticker. 6 volt or 12 volt. 3". Bosch Black on Clear Oblong Stickers. 3", 4", 6" or 9" Pair. Bosch Electric & Spark Plug. Black & White or Black & Clear Stickers. 8" Pair. Bosch Equipment Competition Arrow Head Style Stickers. 8" or 13" Pair. Bosch Germany 6 Volt Oval Yellow Sticker. 2". 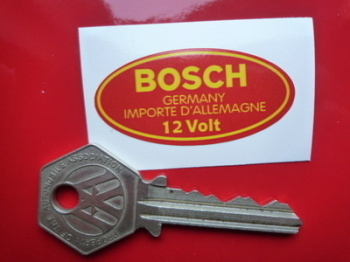 Bosch Germany Importe D'Allemagne 12 Volt Coil Sticker. 1.5" or 2". 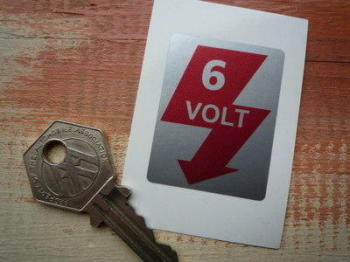 Bosch Germany Importe D'Allemagne 6 Volt Coil Sticker. 2". Bosch Germany. Importe D'Allemagne. Circular Stickers. 2" Pair. Bosch Magneto Logo Cut Vinyl Stickers. 4" Pair. Bosch Racing Team Vienna Spark Plug Yellow & Red Oblong Stickers. 16" Pair. Bosch Red & White Oblong Stickers. 16" Pair. Bosch Red & White or Red & Yellow Oblong Stickers. 6" or 8" Pair. Bosch Spark Plug with Bang Old Fashioned Stickers. 19.5" Pair. Bosch Spark Plugs Black Text & Bang Stickers. 14.75" Pair. Bosch Spark Plugs Red Border Stickers. 5.5" Pair. Bosch Spark Plugs Yellow Oblong Stickers. 15.5" Pair. Bosch Spark Plugs Yellow with Red Border Sticker. 11". Bosch Super-Coil Hochleistungs Diamond Sticker. 2". Bosch White on Black Oblong Stickers. 16" or 19" Pair. Bosch White on Black Oblong Stickers. 9" or 12" Pair.